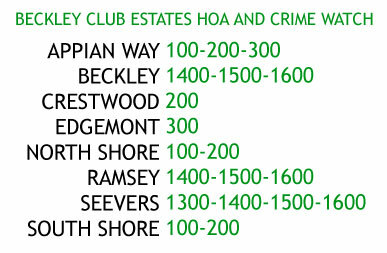 The Beckley Club Estates Crime Watch is under the umbrella denomination of Beckleywood Crime Watch, which also includes the Cedar Oaks HOA. Both are in area 713. Beckley Club Estates is in reporting area 4169, though some addresses may be reported in other zones by DPD. The BCE Crime Watch reports primarily on criminal activity within its own boundaries, but may also include information on adjacent areas.